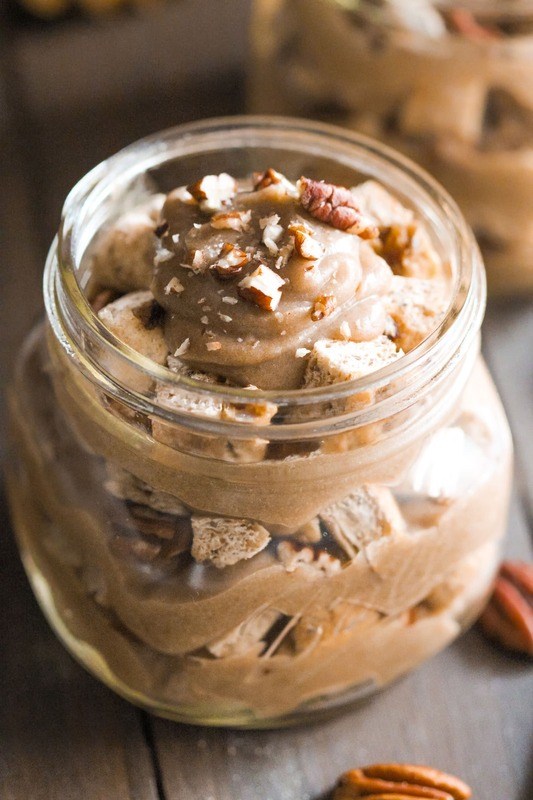 These Healthy Sticky Date Pudding Trifles are like the classic dessert, just reconstructed! Sticky Date Pudding (or Sticky Toffee Pudding) is a classic British dessert — a very decadent treat that consists of sponge cake, chopped dates, and toffee sauce made with lots of butter, cream, and brown sugar. But not these trifles. These are healthy, whole grain, and vegan, with no sugar added! And better yet? No cooking or baking required. Thanks to Ozery Bakery for sponsoring this post, and thank YOU for supporting the brands that keep Desserts With Benefits going! All opinions are mine and mine alone. These are totally breakfast-worthy if you ask me. They’re made with whole grain Ozery Bakery Date & Chia Morning Rounds, Vegan Caramel Sauce (no butter or added sugar here! ), and chopped pecans. If you’re wanting to make this for dessert, serve it with natural whipped cream and a big scoop of Vanilla Ice Cream! These trifles are Sticky Date Pudding (or Sticky Toffee Pudding), just reconstructed! Typically made with sponge cake, dates, and toffee sauce made with lots of butter, cream, and brown sugar, this version is much healthier. And made whole grain and vegan, with no sugar added! Chop the morning rounds into small pieces (I sliced each morning round 6x6 to make bite-sized pieces). In a small bowl, whisk together the caramel sauce and brandy/whiskey. 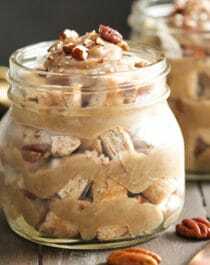 Layer bowls or serving jars with the chopped morning rounds, then caramel sauce, then chopped pecans. Repeat until all the ingredients are used up. Serve immediately and enjoy, or cover and store in the fridge for up to 5 days. I love how the Date & Chia Morning Rounds provide a nice bread-meets-cake-like texture, the caramel sauce is creamy, rich, and sweet, and pecans add the perfect amount of crunch.